Fluvastatin is a type of statin and a drug for the treatment of high cholesterol. The commercial drug is racemic but what about the effectiveness of the enantiomeric forms? Zacharia et al. have argued that as the compound has two chiral centers they might as well synthesize all 4 stereoisomers (DOI). Indole 1 was reacted with 3-(N-methyl-N-phenyl amino)-acrolein 2 to acrolein 3. Enantioselective addition of ketene 4 to diketone 6 was made possible with titanium isopropoxide and chiral catalyst 5, the Schiff base of 3-tert-butylsalicylaldehyde and chiral (S)-valinol. 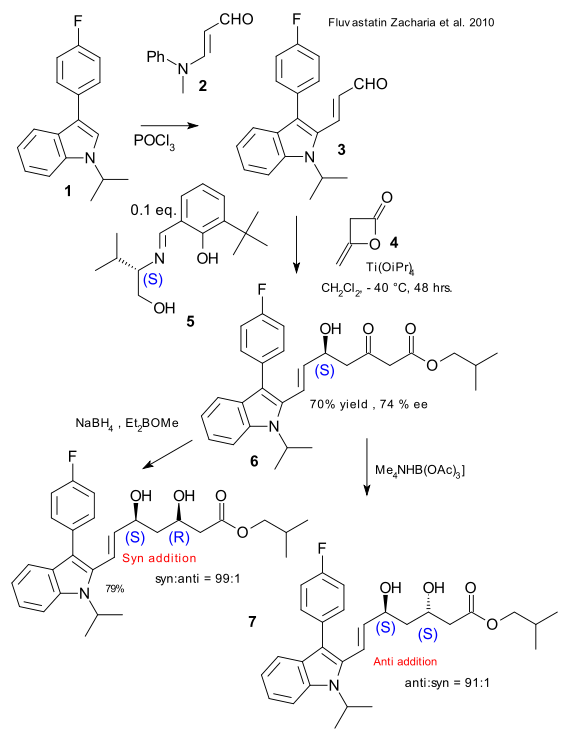 Carbonyl reduction was next: sodium borohydride / diethyl methoxyborane produced the (S,R) syn-adduct and triacetoxyborohydride the (S,S) anti diol 7. By switching the valinol enantiomer and repeating the process the other isomers were obtained.